23. 03. 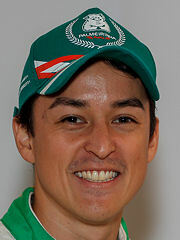 2019 18:49 15 (14 - Nobre Paulo / Morales Gabriel): I keep my average - two spins every stage. Very difficult rally. But everything is good. 23. 03. 2019 14:16 13 (14 - Nobre Paulo / Morales Gabriel): Really really difficult, it's raining a lot. The wipers are not able to clean the window. Very difficult and dangerous. 23. 03. 2019 13:18 12 (14 - Nobre Paulo / Morales Gabriel): We spun two times. It's incredibly slippery, in some parts it's foggy. We spun and had to reverse, we lost a lot of time. 23. 03. 2019 12:29 11 (14 - Nobre Paulo / Morales Gabriel): Like yesterday - twisty, narrow and slippery. And today it's even rainy like hell. 22. 03. 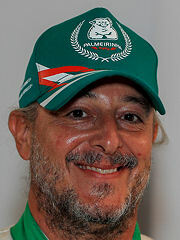 2019 18:59 10 (14 - Nobre Paulo / Morales Gabriel): The grip was great, driving this car is always pleasure. I have to improve my driving a lot, I'm trying. 22. 03. 2019 17:59 9 (14 - Nobre Paulo / Morales Gabriel): In the middle of the stage we went through of lot of rocks. So maybe we got the puncture there. 22. 03. 2019 17:15 8 (14 - Nobre Paulo / Morales Gabriel): It was really narrow, some corners were really tricky. 22. 03. 2019 16:17 7 (14 - Nobre Paulo / Morales Gabriel): Everytime second loops are no surprise anymore, it's much much better. We have a lot of fun. Still it's very narrow and slippery, but the car behaves so good. 22. 03. 2019 14:05 6 (14 - Nobre Paulo / Morales Gabriel): So far so good. Everytime we arrive to the finish we arre happy. This stage was really really twisty and narrow. 22. 03. 2019 13:27 5 (14 - Nobre Paulo / Morales Gabriel): This special stage is the hardest in the Azores rally. Last year we did it in deep fog and this year we can see how deep the volcano is. 22. 03. 2019 12:27 4 (14 - Nobre Paulo / Morales Gabriel): When you think some stage is really narrow, you than find road which is even more narrow!